← Are 1 in 5 Women ‘Sexually Assaulted’ on Campus? Before I continue, Dr. Herukhuti, let me ask you this: Do you believe in redemption? I do. And that’s the fundamental problem with your decision to have Mumia Abu Jamal speak at Goddard’s graduation. If Mumia had owned what he did, repented, and tried to make amends, I’m sure most people would have no problem with Goddard choosing Mumia as a commencement speaker; a remorseful and repentant Mumia would fit Goddard’s educational philosophy perfectly. Fine. But what about the most troubling, provocative question of them all: What happened the night Daniel Faulkner was murdered? Mumia was there, and so was William Cook, his brother, and they saw the whole thing. Why did Cook never take the stand on his brother’s behalf? Why has Mumia, who is supposedly in this unique position to open pathways of critical discussion, never clearly communicated the events of that night, and why does he refuse to even address the question in interviews? Why has Mumia never offered his cooperation in helping bring the killer of Daniel Faulkner to justice? Why has he never reached out to Maureen Faulkner in his infinite wisdom and compassion and tried to ease her plight? I think we know why. And this is the hypocrisy of you, Dr. Herukhuti, and your educational philosophy of a “just and civil” society. Just and civil societies do not give unrepentant killers a commencement platform at the expense of grieving women (Maureen Faulkner, by the way, publicly said your decision was “disgusting”). Regardless of what you believe about his guilt, he is still a cold and callous man, who has mocked civil society, and whose refusal to discuss the night of Faulkner’s murder has tormented the friends and relatives of Daniel Faulkner, as well as the Philadelphia community. When you speak of Goddard’s educational philosophy of a “just and civil society,” it begs the question, Justice for whom? For the grieving Maureen Faulkner? For America’s police officers? For the Philadelphia community and it’s law abiding citizens who made up the jury and found him guilty as charged? Do we not count? And if we don’t, why not? Because too many of us are white? Because we represent the establishment? Because we abide by the law and are not “radicals”? Let’s now for the sake of argument assume Mumia is guilty of shooting Philadelphia police officer Daniel Faulkner first in the back, and then point blank in the face. Let’s assume the four witnesses who identified Mumia as the shooter and so testified in court were right. Let’s assume the two people who signed a sworn statement that they heard Mumia say, “Yeah, I shot the mother fucker and I hope he dies” are telling the truth. Let’s assume the reason why Mumia and his brother William Cook never testified or gave a clear version of events of the night of the shooting is because Mumia did it. Let’s assume the reason why Mumia’s .38 was found at the scene with five empty shells was because Mumia actually fired it—he saw his brother getting pulled over by a white cop, lost his temper, and ran across the street and shot Faulkner in the back and then the face (which is why the bullet removed from Faulkner’s brain matched Mumia’s gun, and why the bullet from Faulkner’s gun was removed from Mumia’s chest). Let’s assume these things are true, just as the jury did, just as every appeals court over the past 32 years—including the PA Supreme Court—have found to be true. What does this say about Goddard? It says that Goddard College supports giving a voice to an unrepentant murderer (not a man who has turned around his life and made amends), that Goddard has no qualms of giving a platform to a man who used violence—first degree murder—to build a platform for his views. This is the most extreme form of radicalism: using murder to deliver a message. That’s what Mumia has done, and Goddard has supported it. The biggest tragedy, though, the most egregious crime against free thought and Goddard’s supposed fight for “social justice” is the fact that your school has indoctrinated its students into believing Mumia is either innocent or did not receive a fair trial. Why else would your graduates request him as a commencement speaker? If you deny this, ask yourself this question: Did you show your students both sides of the issue EQUALLY? Did you lead them back to the primary sources of the case against Mumia—the trial transcripts; the original news stories filed about the murder and trial; the literature written by Maureen Faulkner and Philadelphia syndicated radio host and columnist Michael Smerconish? My guess is that your didn’t. My guess is that you exposed your students to pro-Mumia literature, much of which can be classified as agitation-propaganda based in conspiracy theory, questionable sources, and half-baked conjecture. As a Philadelphia public school teacher, THIS is the most reprehensible part of Goddard’s decision to study Mumia, the fact that you failed to leave it up to the students to decide for themselves, rather, manipulated them into swallowing whole ideas that support your underlying political agenda. 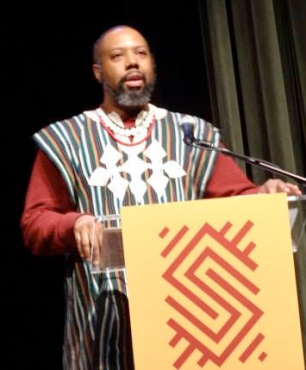 Your educational philosophy of “working toward a just and civil society” is hypocrisy, Dr. Herukhuti, at least in light of your callous and misguided decision to use Mumia Abu Jamal as a commencement speaker; I think it had more to do with getting free publicity for your obscure college than it did with “justice”. As a Philadelphia teacher and guidance counselor, I will from this point forward advise my students against attending a school as irresponsible and insensitive as Goddard College. Goddard was once a respectable educational facility. Who will want to hire their graduates now? Let’s not forget at the trial the family and supporters of mumia spit on Maureen and made pig noises at her when she entered to courtroom. Real respectful . Do you really think that the Mumia case provides no valuable teaching moment? You say in your post “But even if he is innocent…” and then decry his failure to take responsibility for a crime you are assuming he did not commit. But Mumia’s guilt or innocence aside, the issues in this case are representative of much broader problems in our society and criminal justice system; issues that should certainly be taught in our schools. You bring up questions of race and establishment in your post. But don’t comment on the racist comments made by the trial judge, the systematic striking of black jurors that was common practice at the Philly DAs office at that time, ie the McMahon video tape, where the DA trained his employees how to get rid of black jurors without getting caught (http://circuit3.blogspot.com/2005/10/batson-habeas-and-mcmahon-videotape.html?m=1). Your post also doesn’t discuss the withholding of critical evidence in both the guilt and sentencing phases, which was confirmed by the appellate courts but found to be “harmless”. You asked if the students were given the original news stories about the case. But did you read these original articles? Did you see the blatant racism presented in the descriptions of Mumia; the fear mongering that was used by the local papers? Im not saying Mumia is innocent, nor is that the important part of this discussion. However, there is little doubt that anyone who looked at the “primary sources of the Mumia trial” could say they were proud of the way justice was handled in this case. And that certainly is teachable. And who better to provide that lesson than someone who has personally experienced the failings of our system. Because we don’t live in a society where guilt overrides rights; we live in a society governed by a constitution that was designed to protect even our worst members. I hope for the sake of the students you teach that this lesson works its way back into your classroom. First: Judge Sabo. He was a strict, no nonsense judge. Was he racist? Hardly. In fact, Sabo was one of the judges who eventually gave Mumia a stay of execution. It was Mumia who was the racist, calling his African American attorney Anthony Jackson a “baboon.” Mumia refused to follow any of the decorum of a trial, refusing to stand, refusing to acknowledge Sabo, refusing to enter a plea. He was held in contempt and removed from the courtroom 13 time for his outrageous behavior, and for trying to sabotage the proceedings. Next: The jury. Mumia himself, as well as his African American attorney, Anthony Jackson, selected the jury with prosecutor Joe McGill. There were two blacks on the jury. But why does this matter? Are you saying that whites are incapable of being fair-minded? THAT sounds racist to me. Next: The media. I’ve read most of the Inquirer and Daily News stories on the murder and trial. They are neutral and objective. The only people who weren’t being neutral and objective were the Philadelphia Chapter of Black Journalists, who demanded Mumia be released into their custody after Mumia was arrested. Really? Were they serious? The city said not a chance, no way, as they should have. From here on out, months before the trial, the PCBJ decided this was “racist,” and that their former president was not getting a “fair trial”. A well-reasoned and well-stated response to a miscarriage of academic freedom. Thank you for calling out the hypocrisy of Goddard and its president. While I doubt it will resonate with him or his collegiate community, it presents the truth of matter – a truth some cannot bear to listen to, given their bias. Thank you for writing this! As the wife of a retired Philadelphia Police Officer, I wanted so badly to write to anyone at Goddard, to voice my anger/disgust over their choice of commencement “speakers”. You did a beautiful, intelligent job of summing up our outrage. I appreciate it! all responses to the insanity of having this killer as a commencement speaker will be falling on deaf ears I fear. The idiots that support Goddard’s decision are so consumed with racial hatred that they wouldn’t reverse their support if they had actual video footage of the killing. They would just say that the cop had it coming etc. ad nauseum. mind boggling support of this fellon. How is it possible to have this case in Appeals Court for 32 years?